Located in beautiful Estero, Florida on US 41 and Williams is the Meadows of Estero, a gated, Mediterranean inspired community consisting of coach homes sprinkled around sparkling lakes and nature preserves. These coach homes offer 2 and 3+ bedroom floor plans ranging in size between 2000 and 2800 square feet of living area. Most properties were built in 2006 and 2007. The 5000 square foot clubhouse Is complete with a resort style pool, fitness center, library and social room where many social activities are planned throughout the year. 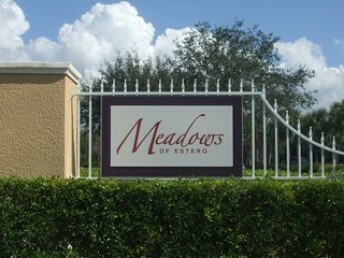 The Meadows is conveniently located to several major shopping centers in the area including Coconut Point Mall, Miromar Outlets and Gulf Coast Town Center. 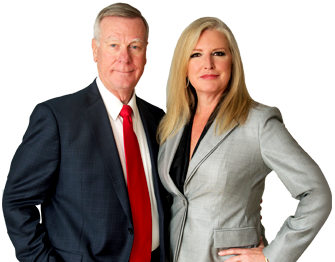 Germain Arena is just 5 minutes away and Southwest Florida International Airport is just 12 minutes away. Publix shopping centers, plazas and plenty of dining choices are all within just a short bike ride. Three Oaks Elementary, Three Oaks Middle School and Estero High School are all within 2 miles of the community. 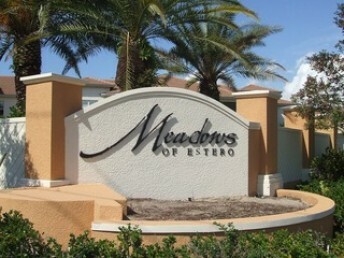 The Meadows is within close proximity to other communities include The Brooks, West Bay Club, Pelican Landing, Fountain Lakes and Rapallo.